Any product change, project plan, change management initiative requires assessment of and approach to working with stakeholders, a term we use to describe anyone who can impact a decision. Stakeholders often slow or block change; in other cases, they bust obstacles and accelerate progress. To increase your likelihood of success, check out this activity from visual thinker Yuri Mailshenko and identify your stakeholders to understand how they feel about your work. The object of this game is to create an organizational map of your stakeholders. In some cases this may look like your org chart. In other cases situation and context will dictate a unique shape — likely familiar but undocumented. In addition to mapping stakeholders’ organizational relationships, you’ll also analyze their contextual disposition regarding your initiative. 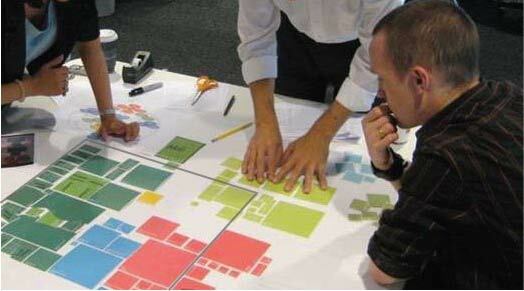 Invite players from across your project’s organizational spectrum to ensure thorough stakeholder mapping. Colleagues with experience from similar projects or relationships with suspected stakeholders may provide valuable information. Invite them, too! Invite your players to a five minute stakeholder brainstorm, ask: Who are our project stakeholders? Ask them to consider teams and individuals both inside and outside your org or company. Have players write one stakeholder per sticky note. Once the brainstorm ends, have each player present their stakeholders by placing their sticky notes on a wall and provide to the group a brief description of their thinking. 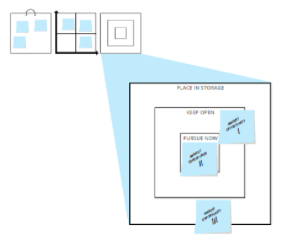 With all the sticky notes on the wall, ask the group to organize them into a rough org chart. This needs only to be an imprecise draft. With the sticky note draft org chart as your guide, create a cleaner version of the org using a whiteboard and dry-erase markers. Ask for a scribe to map the organisation top to bottom. When the scope is quite big (for example, you are mapping a large enterprise), map the parts of the org structure that are less relevant to the analysis with less detail, and vice versa. To help with navigation, label all stakeholders. Denote future parts of the organizations (ones that are missing at the moment but are important to be considered for potential impact). Draw a border around the areas that are affected by the change/initiative or are in the focus of the analysis. Avoid using prepared artifacts like your company’s official org chart. Create on-the-go with full engagement of the group. Draw people. Draw a person as a circle and the upside down letter ‘U’. A group of people could be just three persons put close to each other; avoid drawing departments and teams as boxes. Many organizations are matrices of different kinds. Introducing an extra dimension might create visual clutter. Try to avoid that by either using a different style of a line (dotted or dashed lines) or a different color for a weaker organizational component. Begin a group discussion with the goal of mapping stakeholder disposition and level of support regarding your initiative. Disposition towards the initiative: are they for, neutral or against? To what degree? Why? Level of impact: how much influence will this stakeholder have? High, medium or low? Relationship strength between stakeholders: who do they influence? who influences them? To what degree? Participation energy level: high, medium or low? If you are having difficulty dispositioning a particular stakeholder, move to the next one. Additional conversation may help you get unstuck and you can circle back to the troublemaker. Org charts are quite unambiguous and offer little room for opinion. This exercise’s value comes from mapping less obvious things like stakeholder influence, disposition and decision making power in relation to the initiative. Defined structures are rarely challenged but a necessary foundation. 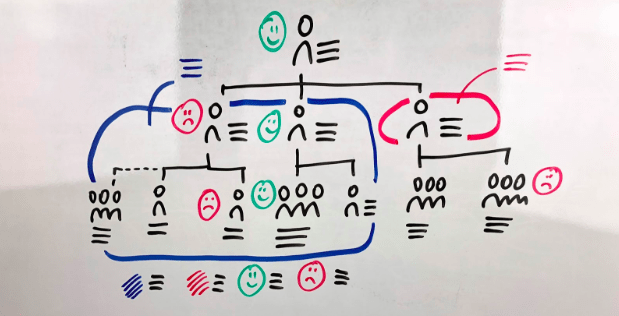 What is interesting is something that lies beyond the official org chart – people’s attitude to the topic of discussion, their real power and influence. Players will share their opinions openly — and surprisingly!–in a safe, structured and collaborative setting. You understand who your stakeholders are and the org design dynamics facing your project, now what? Understanding Chain – create the story your stakeholders need to hear to contribute to your success! 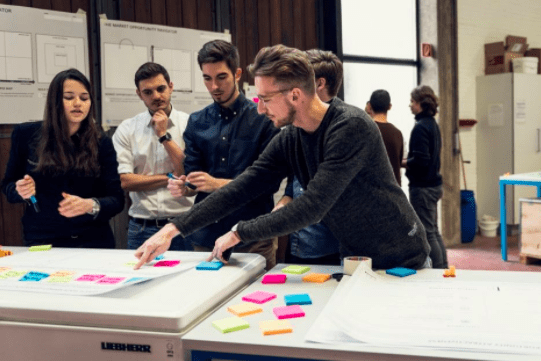 Activity titled by Stefan Wolpers – agile coach and ScrumMaster. Any innovation or technological invention can be applied to serve different types of customers. Understanding your set of market opportunities increases your chances of success: It not only allows you to focus on the most promising market, but also helps you to avoid a fatal lock-in. 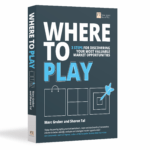 The Market Opportunity Navigator, developed by Dr. Sharon Tal & Prof. Marc Gruber in their book Where To Play, is a tool that helps you to map out your market opportunities and adopt a broad view of your options, so you can set your strategic focus smartly. Unleash the power of new market opportunities by stepping back from your current product and customer assumptions. The Market Opportunity Navigator offers a structured process for identifying, evaluating and prioritizing potential markets for innovation; examine and rethink your strategic focus or plan your future roadmap. This game provides a shared language to discuss, debate and brainstorm with your team and stakeholders. 1-6 players (depending on objective). You can work individually to sketch out your initial perceptions, but a diverse team is recommended if you want to broaden your view and map out your landscape of opportunities more accurately. If you can’t make large prints of the worksheets, it’s OK! You can easily reproduce all the worksheets on flip charts. Room Setup: Place the A0-sized Market Opportunity Navigator somewhere in the room. If you don’t have an A0, draw the templates on individual flip charts and hang. Begin the game with a clear definition of what a Market Opportunity means. Write on the board: A market opportunity is any application of your abilities for a specific set of customers. Inform the players we will now explore each. Ask the players to take five minutes for an individual brainstorm to describe and characterize the core technological elements or unique abilities of the firm in their own right, detached from any current or envisioned application. Write one element or ability per sticky note. Once the brainstorm is done, have the players to put their notes on the wall. Ask for volunteers to sort the notes into meaningful categories (see Affinity Map). Once finished, ask the sorters to describe their process. Summarize the unique abilities of the firm and list their functions and properties on the upper part of worksheet 1. Repeat this process to brainstorm customer problems that can be addressed with these unique abilities. Ask the players to take five minutes for an individual brainstorm and describe customer problems, one per sticky. To broaden their horizon, ask them to think about who else beyond the current customer set might have these problems. What other problems might they have? Encourage players to think wide and broad. There are no ‘wrong ideas’ at this stage. Once the brainstorm is done, ask the players to put their notes on the wall. Ask for volunteers to sort the notes into meaningful categories (see Affinity Map). Discuss what these categories might mean for your company and products. With a strong understanding of both the firm’s capabilities and potential customer problems, discuss with the players different applications stemming from these abilities, and different types of customers who may need them. Summarize these on the lower part of Worksheet 1. At the end of the brainstorm, pick few market opportunities that seem interesting for further consideration. 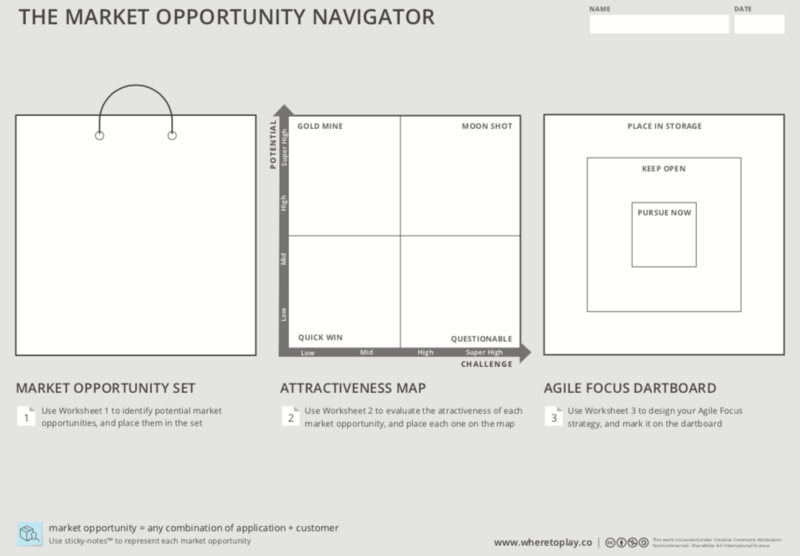 ask the players to briefly describe their idea as they place it on the Market Opportunity section of the Navigator. Use colored sticky notes to represent each of these market opportunities, and place them on the market Opportunity Set section of the Navigator. 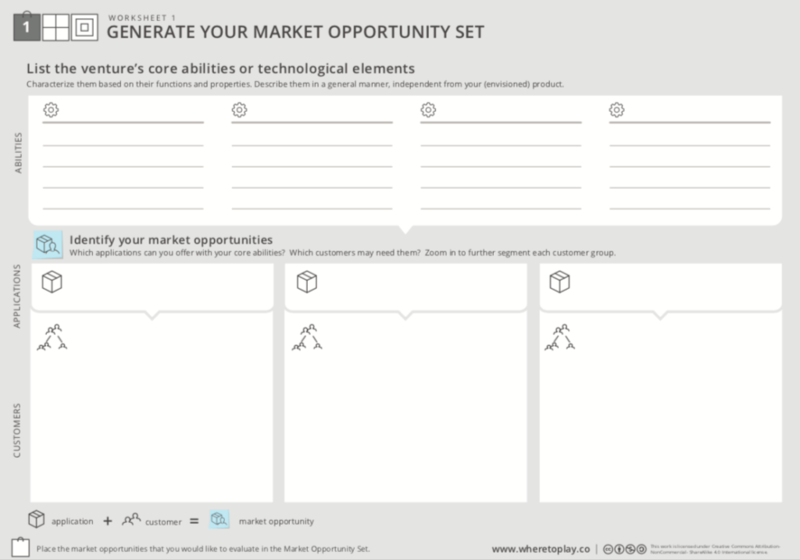 Your Market Opportunity Set is now ready. At this step, players will assess the potential and the challenge of each opportunity in their set, to compare and prioritize options. Market opportunities are not born equal- some are more attractive than others. To begin the evaluation process, explain first what an attractive option is. Write on the board: An attractive option is onethat offers high potential for value creation, and limited challenge in capturing this value. Divide the group into small teams, and assign 1-2 market opportunities to each team. For each opportunity, ask the teams to assess the overall potential and overall challenge of each option, using the criteria described in Worksheet 2. If you do not have an A1 sized worksheet, recreate the template on a flip chart or use smaller prints. Once done, let each team present their evaluation to the group, discuss it with the others, and reach agreement. Then placeeach market opportunity (using colored sticky notes) in the mid part of the Market Opportunity Navigator. Your Attractiveness Map is now ready. Having multiple options at hand is important for maintaining your agility. 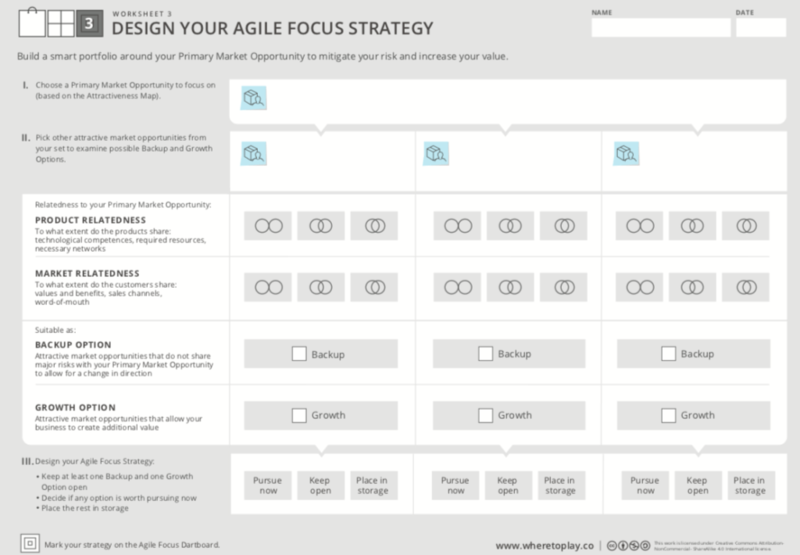 In the last step of the game, you can design your Agile Focus strategy. 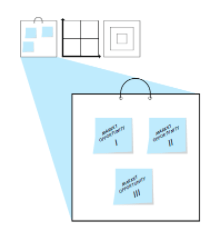 Begin with a clear explanation, write on the board: An Agile Focus strategy clearly defines your primary focus, the opportunities that you will keep open for backup or future growth, and those that you put aside for now. It will help you balance the ongoing tension between focus and flexibility. Players should pick attractive opportunities from step 2, and assess their relatedness to the currently pursued market(s),using Worksheet 3. If you do not have an A1 sized print, recreate the template on a flip chart or use smaller prints. Discuss and pick at least one backup option and one growth option that you want to keep open. 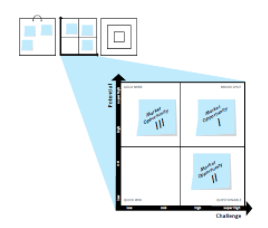 Depict your decision (using colored sticky notes) in the right part of the Market Opportunity Navigator. Your Agile Focus Dartboard is now ready. Discuss the implications of this strategy to your company: How keeping these options open will influence the technology you are developing, the patents you write, the marketing messages you choose etc. You can play this game to advance solid strategic decisions, but also to nourish and nurture the cognitive flexibility of your team, or simply to develop a culture that is more flexible and receptive to adaptations. If you use this tool as a structured decision-making process, more time is required for market validation. In this case, you can map out your opportunities, state your assumptions while doing so, and get out of the building to support or refute them. 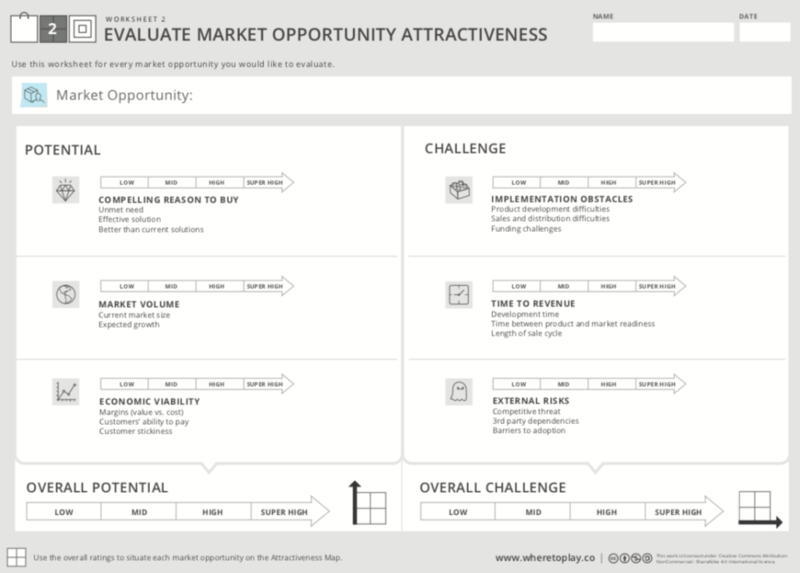 You can then update the Market Opportunity Navigator and reflect on your learning. Use step 2 as a game to assess the attractiveness of a specific business opportunity that you have in mind, and check out if it’s worth betting on. NOTE: We had to postpone the January workshop to March. We hope you can still join! Gamestorming co-author James Macanufo will be delivering a one-day workshop in Boston as part of the WorkBar Workshop series. It is going to be ‘wikkid awesome’ as they say here. In addition, there will be a happy hour the evening beforehand starting at 7pm. Sign up here: http://gamestorminghappyhour.eventbrite.com You do not need to be a registered workshop participant to attend the happy hour. Many fields have long embraced constraints as necessary for creativity. Without bounding the problem you’re trying to solve, it’s difficult to see the big picture, to know where to start, or how to focus your attention – much like trying to write a paper without a thesis. Lately, there is increasing acknowledgement of the importance of constraints such as Jonah Lehrer’s Wired post highlighting the research of Janina Marguc at the University of Amsterdam. It turns out that constraints are also an engaging and effective way to facilitate a conversation, something I’ve learned working with designer Scott Francisco. * Whether you’re trying to balance a budget, plan a meeting, or design a building, workshop activities that make the constraints visible enable better conversations and decision-making. 3. GAME PLAY: Gather a representative group of 12 – 18 stakeholders committed to finding a solution that works by the end of the exercise. Then, play out different scenarios arranging the components to see what “fits” inside the boundary constraint. This can be as one group or with teams working in parallel then comparing and combining results. Along the way, you can discuss and document the merits of each component, the trade-offs, and other options. Do this multiple times to take the pressure off getting it right the first time and photograph each iteration so that you can compare. 4. BONUS ROUND: As an additional option, once you’ve agreed on what fits inside the boundary constraint, you can also continue the discussion to relate the different elements by arranging the components on a sheet; for instance, which programs within the budget depend on each other? What should the sequence of meeting activities be? What spaces within the building should be next to each other? By making the constraints visible and tangible, you enable a better conversation and unlock the creativity of your group to solve problems together. You also have a visible record of the decisions made as well as a shared sense within the group of what’s involved, how the different components go together, and what’ve you’ve agreed on. * Scott Francisco developed a space planning facilitation tool called the Sandbox which uses a kit of parts to try out different workplace design concepts within a limited amount of space. You can read more about it here and here. We subsequently took the principles of the Sandbox and applied it more broadly to the kinds of exercises described above. Subscribe for news, tips, tools and techniques! Submit a game for the collection.